Love is in the air this month in Casale... We have a special 'Love Ride' through the orchard on our vintage Bedord bus. A romantic and relaxing experience for two at the Myrianthousa spa. A guided nature walk where couples can make a wish at the 'Bridge of Love' and the 'Holy Tree of Hope'. But… who are we kidding? Love is always in the air at Casale. Not only today, because it’s Valentines day. You only need to take a short walk into the village and visit Mr and Mrs Koutsonikola to understand that. Married for 60 years this year, they are still as happy together now as they were on their wedding day. You might say it’s because they are always kept so busy – what with four children and ten grandchildren. There is no time to bicker! 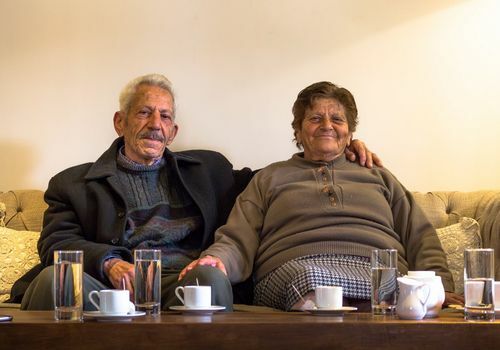 Over the years, they’ve built a beautiful home in Kalopanayiotis where they’ve lived all their lives. It is full of Mrs Koutsonikola’s handicraft work and fresh flowers from the garden. Pop in to say hello and you’ll no doubt be offered a glass of wine and her home-made speciality – Shoushouko - a traditional Cypriot sweet made from grapes and nuts. And then the stories will begin. Stories about how, naturally she had many suitors in the 1950s, but naturally she was most attracted to the village carpenter’s son, Mr Koutsonikola, so... naturally she chose to marry him. Her eyes will light up when she speaks about him as the “best in the valley” and she will tell you that the secret to a happy marriage is… compromise. Accommodating each other’s needs as much as possible and sticking together through thick and thin. And every now and then Mr Koutsonikola, although shy and much quieter than Mrs Koutsonikola, will interrupt to reaffirm that his wife always was, and still is, a beautiful and bubbly person, full of wit and humour… and he loves her being around. He will slowly sip his Cypriot coffee and from behind his cup he will admit that even now, he still has a jealous side and when younger men enter the room, he will lean over and place a warm kiss on his wife’s cheek. "I know the secret to a happy marriage," he will say. "The secret is to always do as your wife says, but only once you have directed her into saying what needs to be done." And you will chuckle all the way back down the cobbled path to your room.